During my testing period I decided to use the pad in my hammock, I caught my head in one of the holes and a tube ripped. If used on the ground this is next to impossible to do, but in a hammock it really quite easy. Again, trust me on that! If it's used how it's intended to be used (on the ground) it'll work, if it's used in a hammock it won't. I warned you! 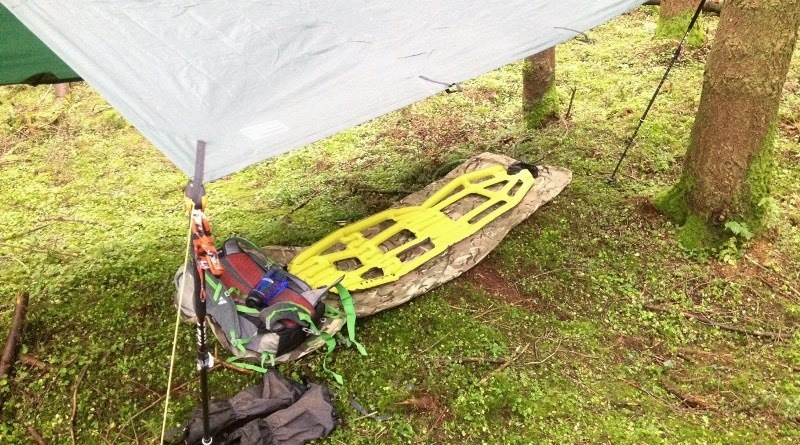 So you're intending to use the pad as part of an ultralight ground sleeping setup? Great, this is a review for you! The loft pockets in action. They reduce weight and in theory they should make your bag feel warmer, although there isn't a drastic increase in warmth they do seem to work. The main feature of the Inertia X-Frame is that it's extremely light, at only 258g (9.1oz) it's a true ultralight sleeping mat, in fact it's apparently the worlds lightest full length sleeping mat! The pad utilizes Klymit's Body Mapping Technology, which should make sure that by shaving weight the sacrifice in comfort is minimal, however compromises are to be expected with a mat like this. The X-Frame uses Klymit's patented Loft Pocket Technology, letting your sleeping bag loft in the empty spaces created by the cut outs. This lets your bag insulate as much as possible. The loft pockets work with the mat inside or outside the bag, however I found that inside was best as it keeps the mat and bag in the same place all night. 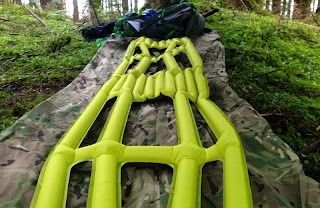 Unlike a lot of inflatable sleeping pads the X-Frame only takes about 5-6 breaths to inflate and is easy to deflate using the valve. 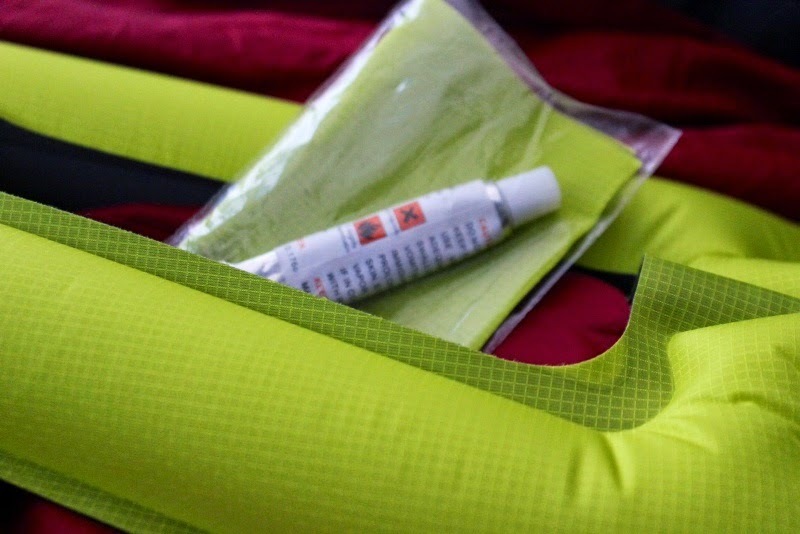 You can top up the pressure in the pad by using the included pump. The X-Frame is made from 30D ripstop nylon for the top and coated 75D nylon for the bottom, making it one of the most durable inflatable ground sleeping pads on the market. I've slept on rough forest ground with no groundsheet and have had no problems with punctures (as with all pads, check for sharp objects both in your pockets and on the ground before you lie down!). I have however heard of leaks developing in the corners, but I've had no problem with this so far, having used the pad for a total of 12 nights at a pretty high pressure. All of the seams on the Inertia X-Frame are heat welded, and all seem very well done. I don't expect any leaks from them any time soon however if any part of the X-Frame fails, whether it be a tiny puncture or a small hole, the included repair kit should sort it out. Do note however that if you rip one of the tubes you won't be fixing that with the repair kit. 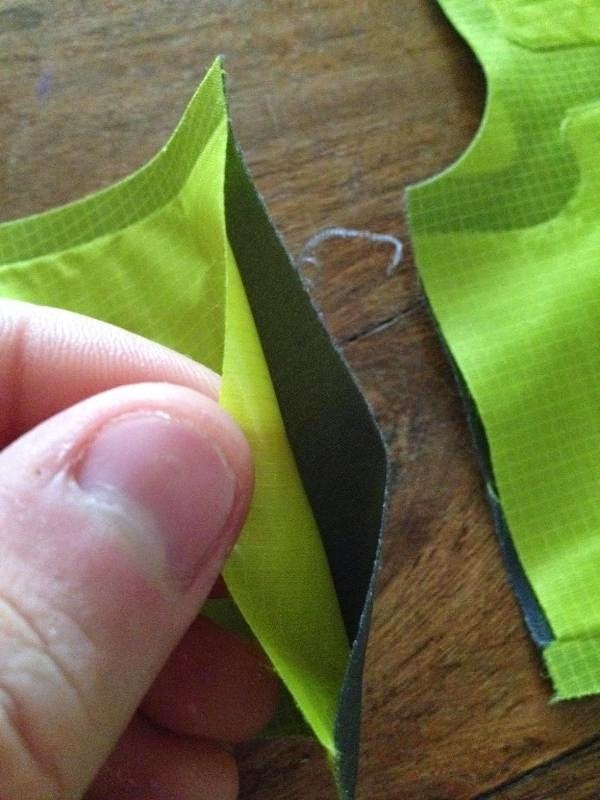 The repair kit consists of a 5" x 3.5" patch of each material and a small tube of adhesive. It's comforting to know that you can also re-weld any of the seams at home with your iron (YouTube link down below). Well it's light, really light. It's not until I tried this mat that I realised just how much unnecessary weight and bulk I was carrying with my self inflating mat. However what you must realise is that the X-Frame isn't designed as a plush comfort oriented pad, it's a lot smaller than many similar pads from other manufacturers. For example when you lie on your back your arms will lie completely off the pad (unless you're extremely skinny), and it could do with a bit more padding in some areas. Klymit's Body Mapping Technology maps out specific parts of the pad to match the human anatomy. I found it surprisingly accurate. The fact that your arms will lie off the pad isn't really an issue, your arms don't really need padding from the ground, the only problem would be insulation. I found that sticking your empty rucksack under your arms worked pretty well however the X-Frame could do with a little more width in my opinion. I think that the padding could definitely be an issue for some. 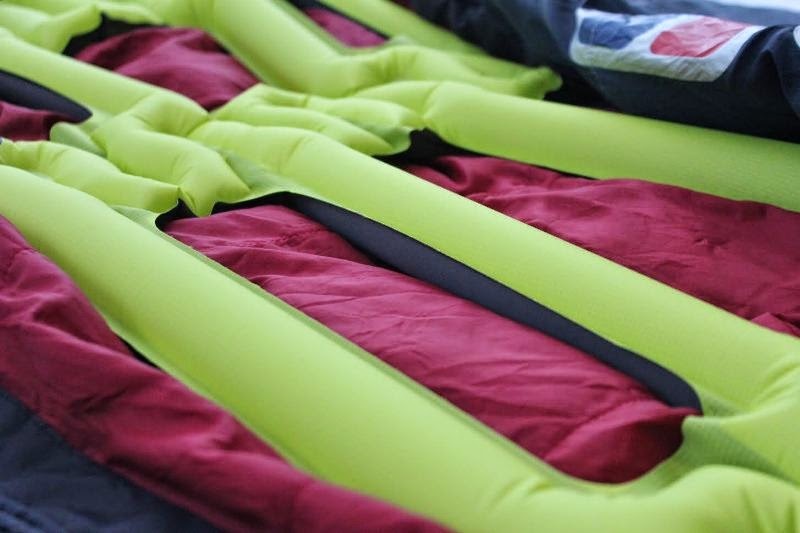 The way inflatable sleeping mats equalize pressure is to shift air from compressed parts of the pad to the less compressed parts, meaning the heavy parts of your body sink a bit. This is mainly a concern around the buttocks- where you have quite a small area distributing a relatively large amount of weight onto the pad. This causes you to sink into the pad, touching the ground if the pad isn't pressurized enough. The solution to this problem is to increase the pressure in the pad, however this makes the pad more solid for the rest of the body (especially the shoulders). There's some skill in striking the balance between too hard and too soft but once you get it the pad becomes noticeably more comfortable. 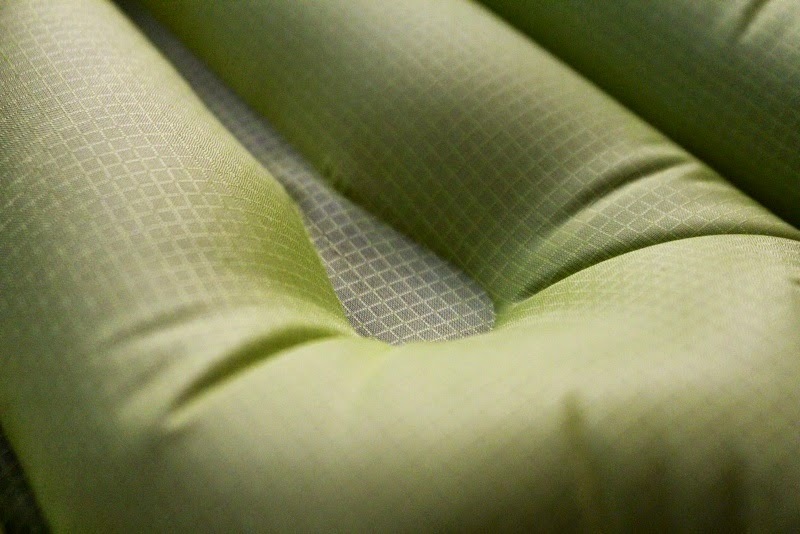 Once adjusted properly the pad is actually quite comfortable- rivaling a lot of self inflating mats. 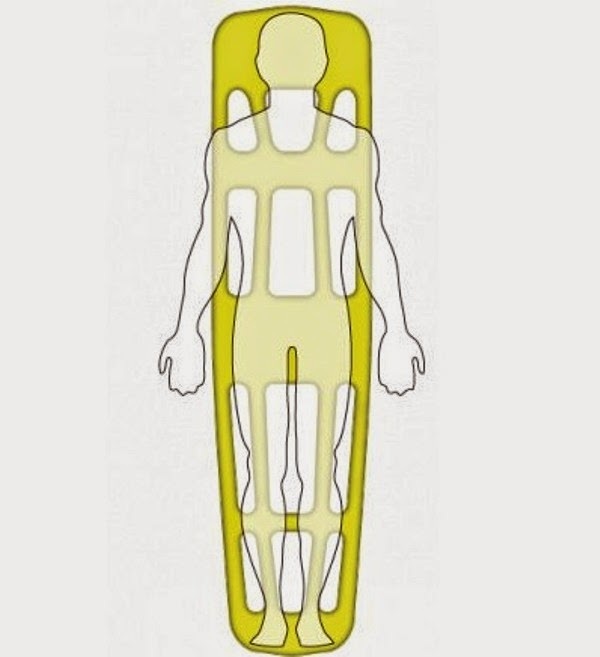 Once you get yourself positioned correctly you feel supported in all the right places due to the Body Mapping you should feel as if you're suspended by bright yellow inflatable clouds. 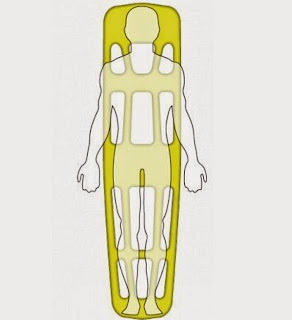 The Body Mapping is designed for back-sleeping, and seems to be designed fore someone around 5'9 - 6ft, any taller or shorter and you mightn't find it as comfortable. I'm 5'10 and found the body mapping to be surprisingly accurate. I also tried the pad for side-sleeping and unfortunately found it to be a lot less comfortable than for back-sleeping. There is a lot of pressure on the hip and shoulder, resulting in pad compression and sore spots. I found if you increase the pressure it supports you better but it still isn't comfortable (you will need to use the pump for this). If you're like me and you usually side-sleep it's better just to try and sleep on your back, as it's a lot more comfortable, but if you absolutely have to sleep on your side you may be better looking at another pad. As I mentioned at the start I tried it in a hammock and the performance was worse than terrible. However as I said, this review is based on the ground sleeping performance, not the hammocking performance. A lot of people say that ultralight camping is all about compromise. In this case it's pretty true, you're compromising comfort for weight, but if you're looking to make your pack as light as you possibly can I'd say it's a fair compromise to make. If you're looking for a really light pad, have a look at Klymit's X-Lite pad, which is exactly the same as the X-Frame but missing the lower section. Thanks for reading, I hope you enjoyed my review! Please leave a comment below with any questions, comments, etc. You can pick up the Inertia X-Frame at Klymit's website for $89.95 here: klymit.shopgate.com. Thanks to Klymit for letting me review the lightest, most awesome looking pad on the market, and to Constantin Gabor for the awesome blog! In case you were wondering, this is what happened when I tried to use the pad in a hammock- not good. If you take anything from this review please understand: this is not a hammocking pad, it really is a great ground sleeping pad but not suitable for hammocks. Disclaimer: Klymit provided me with the product free of charge in exchange for this review. This didn't alter my opinion of the gear in any way. 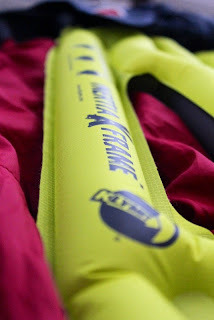 Review by Jake McConnell (part of HighballBlog.com outdoor athletes team who test and review outdoor gear).